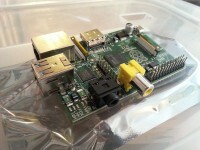 For those that haven’t heard about it, a Raspberry Pi is a super cheap, super small ARM based computer. You can buy one from Element 14 or RS and costs around £ 27. It comes without a case, powersupply and storage. It was made for educational purposes, but has quickly become popular for hobbyists that would like some neat hardware to play with. 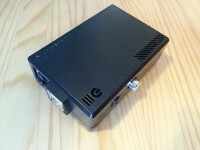 Most people I know plan to make a media center using XBox Media Center (XBMC). It has composite and HDMI out, and can play HD video. Not bad at all! I already have an AC Ryan Playon!HD which works pretty well. It makes some noise, but it do come with a remote control out of the box, and it can also record from composite. The Raspberry Pi can’t record out of the box, so until I can find a solution for this, and a nice remote control, the AC Ryan will stay beneath my TV. My project was for something different. I wanted to make a small server that could run all day without any noise and serve SSH from outside. And of course it should run Linux! The fact that it has the size of a deck of card is certainly a plus also! In my opinion, one of the beauties of the Raspberry Pi is that it boots from an SD card. This makes it incredibly easy to test different software. Find an image of a distro, write it to the SD card, put it in and boot! Want to try something different without ruining the software you just set up? Pull out the SD card, write to another SD card, put the new on in and boot. Really nice for fiddling! It is pretty impractical to have this cool thing around without any type of cover. I therefore bought a chassis from ModMyPi. In the next post about this cool thing, I will talk more about installing the OS. Previous: Previous post: Makro, elg og landskapsfoto – Alt på samme tur!